The Air Force said she had been removed on Tuesday by Col Derek O’Malley due to a “loss of confidence in her ability to lead and command”. Officials have not offered details into what prompted the decision, but Col O’Malley noted she had made “mistakes”. Capt Kotnik’s predecessor Maj John Waters has resumed command of the team. US Air Force (USAF) Capt Alannah Staver, chief of public affairs at Shaw Air Force Base, confirmed to the BBC that Capt Kotnik was relieved from command on 11 February but could not provide any further details. The Viper team is one of four air performance teams under US Air Combat Command (ACC). Their demonstrations help with recruitment efforts, showing off plane and pilot abilities at air shows and events to some 10 million spectators per year, according to the USAF. The news of Capt Kotnik’s dismissal was first reported by the Air Force Times. In a statement on Facebook, Col O’Malley said: “We have thousands of Airmen across our Air Force serving our country, and not one of them is perfect. “As good people, like Capt Kotnik make mistakes, I want them to have the opportunity to learn from them without being under public scrutiny, and to continue to be a part of this great service. Col O’Malley said it was “exciting to have the first female demo team pilot here at Shaw” but he was excited about the other women currently serving in the Force too. Capt Kotnik has not commented on her dismissal and has apparently deactivated her social media accounts. Her first air show as commander had been scheduled for 30 March. She will still serve in a non-supervisory role with the 20th Fighter Wing at the Shaw base in South Carolina, Military.com reported. 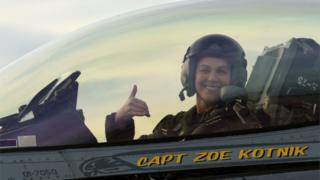 Capt Zoe “Sis” Kotnik’s appointment as commander of the ACC F-16 Viper demo team on 29 January had been announced with fanfare and excitement. The USAF hoped to use the buzz around the upcoming superhero film Captain Marvel – where Brie Larson stars as an F-16 pilot – to bolster recruitment. Capt Kotnik’s appointment to lead the 17-member team was even revealed in a comic-book style post. In addition to becoming the first-ever female Viper commander, Capt Kotnik was the first female single-ship tactical demonstration pilot, according to the Viper team. “What I’m looking forward to most is the potential to have an influence on younger generations,” Capt Kotnik said in a statement at the time of her appointment. “I know firsthand how impactful airshows can be and what a difference it makes to young people to see just one example of what they can do and who they can become. Capt Kotnik was born in Poynette, Wisconsin, to a family of aviators, according to her USAF biography. She studied economics at the USAF Academy and earned her wings in October 2013, when she began learning to fly the F-16C Fighting Falcon. Capt Kotnik spent a year in South Korea at the Kunsan Air Base before returning to the US to train fighter pilots and support anti-terrorism air defence efforts with Operation Noble Eagle. The combat-ready fighter pilot has over 1,000 flight hours under her belt. Previous Can the Democrats Green New Deal really work?